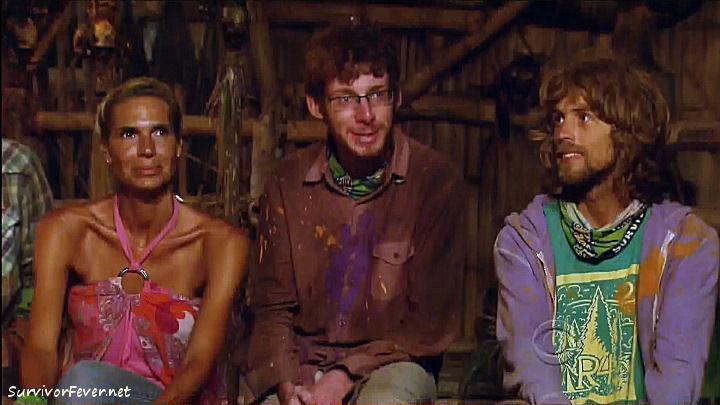 This episode will forever go down as the best episode in Survivor history (thus far at least)! As Cochran says at Tribal council, “This is why I have loved Survivor for the past 13 years!” So I couldn’t resist but blog about it. Reward challenge… everyone is split into two teams. Purple team: Reynolds, Erik, Dawn, Cochran, Philip. Orange team: Andrea, Malcolm, Eddie, Brenda, Sherri. Challenge itself not too exciting. Malcolm tried a strategy that did not work and Sherri was so slow it really sealed their fate. Purple team won the reward which was going to a resort with a shower, a pool, and a lunch that consisted of beef, chicken, cocktails, etc. Everyone showered first before getting into this fabulous infinite pool except for Philip who just jumped right in still full of mud and rice from the challenge and completely dirtying up the pool. Oh and he was naked. Ewww. Dawn hasn’t slept more than a few hours in days. She’s literally losing her mind and getting paranoid that Andrea’s main target is her (Dawn). The “Stealth R Us” alliance decides their main target out of the “Three Amigos” (Malcolm, Eddie, Reynolds) is Reynolds. Morning of the immunity challange, Dawn wakes up completely rested. Says she slept the entire night through and she is like a new person! Dawn in this case completely reminds me of me after my first child was born and I was sleep deprived and looney. But at least she has her head back in the game. I’m strangely pulling for her even though there are several I like more than her. She’s a good person. So immunity challenge comes and it is done in heats. The players have to jump in the water off of a platform, grab on to a rope and pull themselves to the other side of the platform where they will pull themselves back up on it and then bring a ring from that side of the platform to the other, jump in again and do the whole thing all over again. First two done go on to the second heat. First up is Reynolds, Andrea, Dawn, Conchran, and Sherri. Reynolds and Andrea finish first and are moving on. Second heat is Eddie, Brenda, Erik, Malcolm, and Phillip. Oh but wait! Just as the players are about to dive in, Philip stops Jeff Probst to tell him that he’s sitting out this challenge. WHO voluntarily sits out an immunity challenge? Philip does, apparently. He says that he had a traumatic incident as a kid that has left him with a fear of being trapped underwater. Whatever. So Brenda and Malcolm end up winning the heat. Final heat with Malcolm, Brenda, Reynolds, and Andrea… they have to do it all over again except this time there are 5 rings… they have to do this 5 times!! Reynolds and Malcolm dominate the entire time and Reynolds just barely beats out Malcolm. So “Stealth R Us”‘s main target now has immunity. The next day (or later the same day??) Everyone decided to go looking for the hidden immunity idol that is back in play since Reynolds played his last week. Malcolm ends up finding it, but in front of a group of people, so he has to be honest and show them he has the idol. What nobody knows is that Malcolm already has an idol and this is actually his SECOND one! Stealth R Us decide to split their vote at tribal to flush out the idol and to get Eddie to go home. At tribal council Jeff questions everyone about the alliances and it is made clear that the “Three Amigos” are the target and since they can’t vote out Reynolds and they know Malcolm has the hidden idol, that only leaves Eddie left to vote for. Malcolm gets his turn to speak. He pulls out his immunity idol necklace and puts it on. Then he says, “We know Reynolds, Eddie, and I are on the outs. No one will speak to us, it’s like we have the plague or something. But this is a game and so we thought we would do something about it and tonight we’re going to try to. Here’s the other immunity idol I have had for awhile and I’m giving it to Eddie. I know for one vote we have control. The three of us are not going home tonight and we are voting for Philip. Philip is the fun sponge and he is sucking it all out of this game.” PANDEMONIUM at tribal council. What?!! This is crazy!!! The whole “Stealth R Us” alliance is whispering “Andrea?” “Philip?” Trying to get their act together and decide who should go home. They are all completely blindsided and FREAKING out!! Philip suggests that they keep the vote the same and split the votes between Malcolm and Eddie because no one knows if they will actually play the idols. They are not safe unless they actually play them. It’s time to vote! Before Jeff reads the votes he asks if either of them want to play their idols. Eddie immediately plays his and then Malcolm reluctantly also plays his. The Three Amigos are officially safe and now the remaining alliance of 7 people is about to be broken up. Jeff tallies the votes and Stealth R Us split their votes between Eddie and Malcolm with the exception of Erik who for some reason vote for Philip. The Three Amigos vote unanimously for Philip who is then voted off. Tribal council has spoken. That was exciting and I am so incredibly happy Philip is finally gone!! Oh I also want to add that as everyone is freaking out and scrambling, Cochran is like a kid in a candy store as he realizes he is part of major Survivor history by the epic tribal council. He has mad respect for what Malcolm just pulled off. Posted by amandatalkstv on April 17, 2013 in Uncategorized and tagged Andrea, Brenda, Cochran, Dawn, Eddie, Erik, immunity, Jeff Probst, Malcolm, Philip, Reynolds, Sherri.